From Washington State arrives a fresh, new airplane created from scratch to enter the Special LSA space. You don’t know the company but you may know the people, at least indirectly. Welcome to Vashon and their new Ranger R7! Ranger R7 is an all-metal, two-place, high-wing, single engine airplane equipped with tricycle landing gear and castering nose wheel. The company says Ranger has been in development for five years and has been flying for more than two. 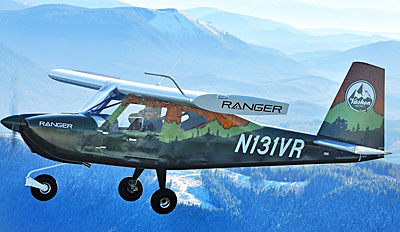 Vashon Aircraft was founded by John Torode, and the Ranger R7 was designed by Pacific Northwest aeronautical engineer, Ken Krueger. Does the name Torode sound familiar? It should. 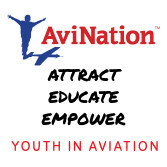 This is the man behind Dynon Avionics. Other key players are General Manager Scott Taylor and Marketing Manager Amy Bellesheim. 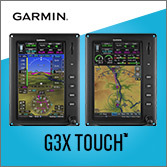 The design goal appears to be a rugged outdoor-action airplane but with sophiciated avionics, a natural if unlikely pairing resulting from the close relationship to Dynon Avionics. 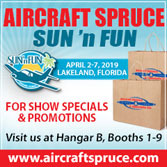 Aiding the rough-and-ready approach are easy-loading doors that open 180 degrees; seats that fold down 90 degrees to facilitate camping and large cabin volume capable of holding such gear. 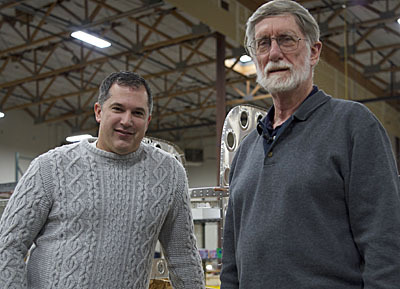 “Another thing that we wanted to accomplish with the airplane was to make very rugged landing gear,” said Bellesheim. The main landing gear is a fiberglass leaf. It’s very similar to what Jim Bede did on the Grumman American airplanes. Scott Taylor, General Manager poses with Owner and CEO, John Torode (R). 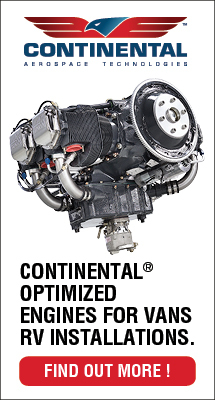 For power, Vashon chose Continental‘s O200-D 100-horsepower engine swinging a Catto composite fixed pitch propeller. With a castering nosewheel, steering is by differential braking. Dual toe brakes are supplied and pilot height is accommodated with adjustable rudder pedals. Ranger’s cabin is 46.7 inches wide. Performance Data: Takeoff distance — 315 feet; Landing Distance — 475 feet; Rate of Climb — 1,035 feet per minute; Top speed at gross weight — 119 knots; Cruise Speed at gross weight, 2750 RPM, 7,500 feet density altitude — 117 knots; Range at gross weight — 430 nautical miles. Pricing for the “Yellowstone” base model is $99,500. 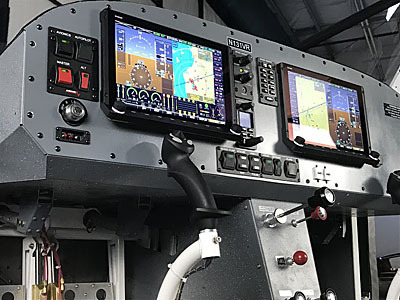 Ranger comes with complete Dynon SkyView HDX-equipped panel including two-axis autopilot, 2020-compliant ADS-B Out, and ADS-B Traffic and Weather. For a full list of what is included, visit Vashon’s website. 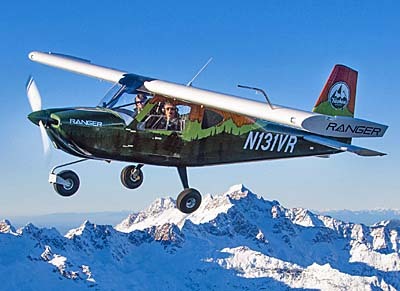 Learn more about Vashon Aircraft and the Ranger R7 and see some video clips of the new bird in flight. 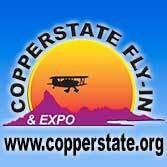 The official launch and public unveiling will be at AirVenture Oshkosh 2018. Hi Gary: Thanks for your kind words and for your comments. I’m glad you like the legacy engines but I’d be careful about doubting the Rotax will stand up to the competition. I’m sure the folks at Vashon will enjoy seeing your enthusiasm about their new model. Also, would larger tires work on this model? How robust it the tri gear landing? Hi Robert: I am sure larger tires could work fine. The gear appears very robust. It was designed with heavy use (like flight instruction) in mind. Dan: Bob Nilsen here again. Would you build one for me with the 180-horsepower engine. I fly at high altitudes and sometime in pretty warm weather. I need the extra power. I am also a pretty big guy around 235 pounds. Thoughts? Hi Bob: You need to approach Vashon with that question. Contact info appears in the article. have a Carbon Cub. Love the price!! 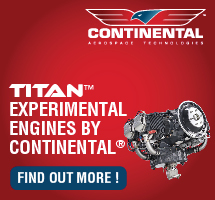 Hi Bob: The Continental engine is not available with a turbo charger, but Continental Motors‘ Titan brand does offer much more: 180 horsepower, an extremely similar engine to the one that is offered on the Carbon Cub line. Kudos to Vashon for investing the time and money. The owner has changed dramatically avionics, so he’s likely to do the same with airframes. Having Ken Krueger as the designer/engineer speaks volumes. I would not be surprised to see a Rotax option and other paint options soon. The skins are of pre-painted sheet, the landscape is surely a wrap. Might be nice for the Northwest but kinda odd for us in the Southeast. A “clean sheet design” yet they built the aircraft around the Continental O-200D rather than a Rotax? Ignored the many excellent choices from Rotax (standard, injected, turbocharged, and various combinations), plus fuel flexibility (auto fuel or 100LL), plus the weight penalty of the Continental? Such a shame. Was nothing learned from the Skycatcher debacle? I love the idea but with full fuel and me inside (I’m only about 8 lbs over my ideal weight), I can carry 93 lbs of passenger. Or, with two my size inside, I can carry enough fuel for 1.5 hours with 30 minute reserve. Awesome for solo flying but I like to share the experience. Hard to do in this bird. I’m very interested. Wondering if there might be an amphibious float version a la the Legend Cub? Marty: I understand floats may be considered but the aircraft has not yet entered production as a land plane so patience is urged. Update – I recently took delivery of N135VR and could not be happier with my decision to sell my SR22T and move to LSA flying as I approach retirement. The numbers are spot on and with my wife and half fuel we launched in less than 500 feet and climbed at 800 FPM from field elevation of 460 feet MSL at 72 degrees. [The Vashon Ranger] had plenty of climb left in her and probably would have performed just as well with full fuel. Looking forward to new (albeit slower!) adventures but getting there quickly isn’t the priority anymore. Plus, my wife wants to learn how to fly her — not as intimidating as the Cirrus. Love the airplane except there are a couple of things that would absolutely prevent me from buying one: One, it can’t use auto gas!, and two, if a mural painted on the airplane is mandatory I’m out. I asked friends as well about that paint scheme and not a single one liked it, not one. In fact like me they all were wondering if it was some sort of joke. I know it is simply aesthetic but good lord!, a forest and mountain scene painted on an airplane! Auto manufacturers know that shade of green and then a mural does not sell cars. I think airplane manufacturers should know this as well. 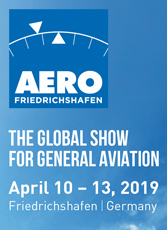 Aside from those two deal breakers I like virtually everything else about that plane and am impressed by who is producing this product and really impressed by the money transfer to a new airplane on ramp transaction on the same day; [a good] business practice of this company. 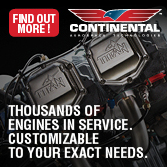 I understand the Continental needs to use 100LL and not auto fuel? My current favorite personal airplane prefers less expensive auto fuel or 100 LL. 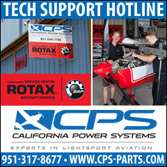 Hi Skot: Many agree with you, explaining why Rotax and Jabiru and most auto conversations own such an overwhelming share of the light aircraft market for powerplants. I would prefer a less “busy” paint scheme. I’m also not interested in the glass panel and auto pilot. Could either be optional with a price reduction? I’m very excited about your plane. Flight schools will like the O200-D. But guessing individual buyers will want more horsepower. Wish they’d offer a Rotax 914/915 option. Almost a necessity for safe summer flying in the mountain west. This airplane looks like it would fit into a flight school for basic training and be an inexpensive time builder as well. Is it eligible for export to Canada? It would get great exposure here at the Springbank Airport in Calgary, Alberta. I have never heard of such a thing as eligible or ineligible export to Canada … There are no general aviation planes from anywhere in the world that Canada bans, and certainly none from the U.S.
You obviously have not had many dealings with the rules that Transport Canada have pertaining to a new type entering Canada. There needs to be copies of the maintanence, parts and operating manual submitted and accepted prior to importing a new type into the Country. We imported the first Varga Kachina and it took quite some time and expense to get it in and licences. Just started my private pilot training, the planes are really old. So it’s good to see new planes being made. Been in aviation 40 years I make some critiques. – and comments deleted what gives? Hi Dan: Sorry for a few days delay. We did not “delete” any comments but due to out-of-town travel we were delayed a bit posting your other one. Need more useful load. Other than that great. H Lyndon: My guess is you really mean payload and Ranger is fairly limited in that area. However, as I mentioned, the first one is a prototype and hopefully they can shave a few pounds as production starts. We’ll see; that is not the way it usually happens as airplanes, like their pilots, tend to gain weight over time. Looks like a nice airplane but with a useful load of 445lbs, it will not get very far from the patch with two adults! Go for a trainer to practice touch and goes, but going to any back country strips will leave you stranded while searching for av gas. As this first Ranger is a prototype, some are hoping/expecting a reduction in empty weight to allow more payload. You read between the lines well, John. I would love to see an addtional 200 pounds of useful load. Would be very tempted to give up my Cherokee 180 for this modern sleek aircraft!! Keep working on it. Hi John: I imagine what you meant was that Ranger could use more payload. However, some LSA can come close to a Cherokee 180 if you only need two seats. I agree the pay load is limited. Also most pilots would prefer a steerable nose wheel instead of a castor type nose wheel. I wonder what the cabin dimensions are; the C-152 is cramped. I would prefer a different engine for two reasons. One, with the fuel situation a dual fuel engine would be preferred. Two, I do not want to buy a engine that comes from a Chinese company. 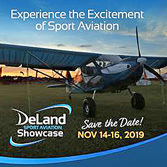 Dan – I, like [many people] don’t like purchasing much, if anything, made in China, Vietnam, Indonesia, etc., but Continental employees are some of my friends as I live in Mobile and fly a Cessna 182 here. True, the company is owned by a Chinese company, but the engineers and techs manufacturing and supporting the engines are some local long-timers and make an excellent product. One of them is one of the A&P/IA who servicse my 182. If we quit buying goods from any company from Asia, or other “kid factories,” we won’t be purchasing much. So made in China versus made by a Chinese-owned company are two different risks. Also, I too wish the useful load was higher, hence the 182. Seems like a winner, but… change the colour scheme on the demo plane; it’s a (marketing) disaster. It confuses the eye and gives the viewer the impression that the aircraft has a particular purpose rather than emphasizing that it is a terrific piece of engineering for a great price — period. This airplane seems to be everything I would want except for one item. I desire folding wings for storage and transport reasons.